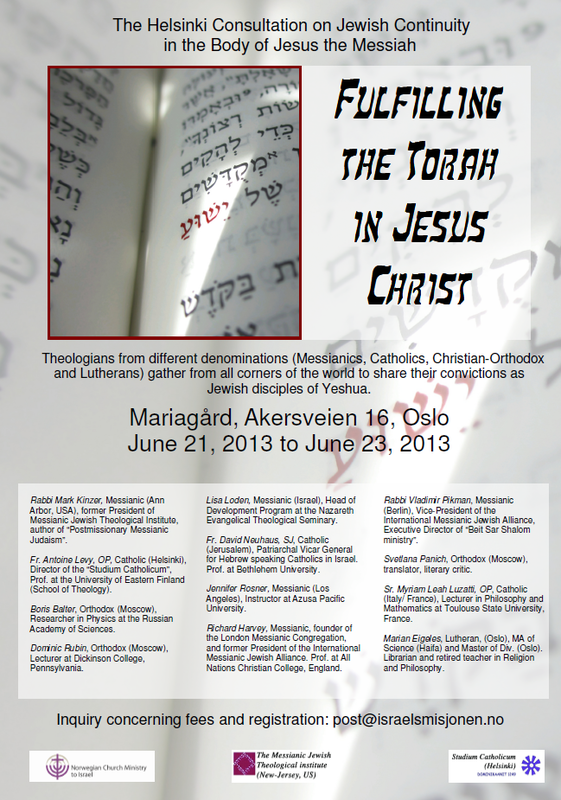 The theme for the Helsinki Consultation conference in Oslo, held on June 21st through 23rd, 2013, was Fulfilling the Torah in Jesus Christ. It is a reference to the Gospel of St. Matthew (5:17). It articulates a formidable practical and theoretical challenge facing Jewish believers in Yeshua: Can one at the same time keep the Torah in its tangibly Jewish dimensions and be faithful to the teaching of Christ? What happens when 'Church Jews' rediscover the significance of Jewish mitsvot and Messianic Jews take Yeshua's conflict with rabbinic traditions seriously? Whatever message arises from these cross-encounters, it will shape the quest for a Jewish expression of the Christian faith during the rest of our century. For more information about the Consultation in Oslo, please go to the Helsinki Consultation website. You will also find details of the Helsinki Consultation Conference in Oslo on the poster on this page and in this brochure (pdf).